While West is courting Beijing, it appears to be wooing the Asian littoral to increase access to ports and airfields. Vice President Xi Jinping, who is widely believed to succeed President Hu, was in Dhaka, while Prime Minister Wen Jiabo became the first high ranking Chinese leader to visit Yangoon in 16 years. Vice Premier Zhang Dejiang led a 30-member delegation to Colombo just when Sri Lanka President Mahinda Rajapaksa was holding one-on-one meetings with the Indian leadership in Delhi. All the three visits took place in the month of June, almost around the same time. Xi Jinping held talks with Prime Minister Sheik Hasina, met her predecessor, Khaleda Zia, and called on President Zill-ur-Rehman. He announced a US $ 5.8 million grant for infrastructural development (India offered a US$ One bn Line of Credit marking the Hasina visit to Delhi early this year). Since 1975 Beijing has contributed significantly to Bangladesh’s development, particularly roads and bridges and defence sector. It also provided diplomatic support just as it is doing now in Sri Lanka and Myanmar. China –Bangla trade estimated at around $ 4.8 bn is one-sided. China has cornered $ 4.4 bn with its multiple exports. Vice President Xi conveyed to Prime Minister Hasina that Beijing is considering giving duty free access to some 5000 Bangladeshi products. The move may benefit Bangladesh only marginally as the target for bilateral trade volumes is $5 billion. But the ruling and opposition parties were impressed. In fact, so encouraged was Khaleda Zia that she asked her guest to help in building the Bangladesh army, navy and air force into a “three dimensional defence force to maintain stability in the region”. The proposal will have diametrically opposite affect though. While Pakistan’s armed forces have a mix of Chinese and American weapons, Bangladesh forces are built on acquisition of weapons and training from China. And during Khaleda’s second stint as Prime Minister (2001-06) China supplied C-802 surface-to-surface anti-ship missile with a range of 120 kms, and mounted on a frigate. The C-802 is an attack weapon. The Chinese Vice President’s response is not known but officials of the two countries said China has assured the Bangladesh leaders of the long road link from Kunming to Chittagong through Myanmar and a deep sea port in Chittagong. The two projects have strategic significance as much to China as to Bangladesh’s neighbours. Bangladesh government has already commissioned “Study and Design for Bangladesh-Myanmar link road”. In the first phase, road links to the border will be laid – two km stretch from Ramu to Gundum on the Bangladesh side, and 23 km road between Taungbro and Bolibazar on Myanmar side. The second phase will be an all Myanmar affair with Bolibazar connected to Kyanktow (110 Km) where exists a road to Kunming. The Chittagong deep sea port will be Bangladesh’s Gwadar that was built by China on Pakistan’s Balochistan coast. It will be part of the ‘String of Pearls’ (Hambantota in Sri Lanka is another pearl) China is creating as a part of its oil security drive, power projection, and the eventual deployment of its navy in the Indian Ocean and the Arabian Gulf. Energy hungry China depends on Middle East, Africa and Iran for a staggering 80 per cent of its oil demand. So, Chittagong is designed to emerge as its transportation hub for oil imports cutting down on logistics and time. A deep sea port has, however, wider conjuration militarily speaking since Chinese commentators keep saying that Indian Ocean is not India’s Ocean. It offers a perfect fit for stationing surface and sub-surface platforms as is the plan already at Gwadar. It is for Bangladesh to decide if it wants its Bay to get militarized. More so as China is busy at the Coco Islands. Vice-Premier Zhang Dejiang sojourn through Sri Lanka and his talks with Prime Minister DM Jayaratne are no less significant. While President Mahinda Rajapaksa visit to Delhi resulted in signing of seven agreements, the Zhang –Jayaratne discussions culminated in six pacts on cooperation in information technology, communications, development of highways and maritime ports and the second phase of the Hambantota Port project. President Rajapaksa met the Chinese guest for breakfast soon after his return from India on June 12. Hambantota Port is coming up at a cost of US$ One billion in the three phases. 80 per cent of the outlay of $360 million on the first phase is met by China by way of soft loan. The Chinese leader conveyed to his hosts that Beijing is keen on commissioning the first phase by end of this year (2010) and then quickly take up the work on the second phase. He offered $ 200 million as soft loan from China Exim Bank for the second phase. Hambantota is Sri Lanka’ second-largest urban conglomerate after the capital, Colombo. It is the home base of President Rajapaksa. That explains the importance of the project which is designed to be ready in all respects by 2023. Hambantota was devastated by tsunami in 2004. The President has already gifted a convention center, an office complex and a cricket stadium as a part of the city’s redevelopment plans. China’s eagerness for timely completion Hambantota’s first phase is understandable. Gwadar’s first phase is just over. In case it gets sucked into the Balochistan’s violence syndrome – as locals see the port as a symbol of exploitation, Hambantota gives the fall-back option to the Chinese navy. It is for this reason that China is attaching equal priority to the early completion of the Kyakpyu port off the Arakan coast in Myanmar, the construction of which started last year. In other words, Chinese interest in Hambantota is more strategic than purely commercial. Rajapaksa government may not allow Chinese Navy to use Hambantota against India. But he may certainly use the China card in his dealings with India just as he had deftly exploited the American soft underbelly with the Iran card. A Chinese naval presence in Hambantota will increase the vulnerability of Southern India and to that extent will add to the concerns of the Indian Navy. Since 2006, the Chinese government has provided $3.04 billion in financial assistance to Sri Lanka. Some of the projects with China stamp are Katunayake Expressway, Matara – Kataragama rail link, the Norochcholai Coal Power Project, and the building to house the Centre for the Performing Arts in Colombo. For some strange reason, which is as yet unfathomable, Sri Lanka has kept private details about some Chinese projects. These include a power plant, an arts center and a special economic zone. A Sri Lankan newspaper, Sunday Times, estimates that China is involved in projects totaling $6 billion — more than any other country including India and Japan, which have historically been big donors and investors in Sri Lanka. Even in areas dominated traditionally by Korea and Japan, like cranes for moving containers at ports, China has emerged as the player. Noted Sri Lankan economist, Harsha de Silva, has an interesting take on the development, though it appears rather uncharitable. According to him, the Rajapaksa government prefers China because ‘it doesn’t impose conditions like competitive bidding and transparency in its business dealings’. Chinese ventures are coming the Lank away at a price. The interest on credit is at commercial rates and is high vis-à-vis the loans on offer from India, for instance. Chinese Premier Wen Jiabao visit to Myanmar is historical though ostensibly it was to mark the 60th anniversary diplomatic relations between the two countries. It came as the old guard generals are preparing to hold elections to pass on the baton to the younger generation. And befitting the occasion, the junta rolled out the red carpet. There is a mutuality of interest between the two countries, undoubtedly. While China eyes Myanmar’s natural resources and sea ports, Myanmar’s generals depend on Beijing for aid, arms and above all diplomatic safety net to mitigate the affects of global isolation and sanctions. China is Myanmar’s second-biggest trading partner after Thailand (two-way trade peaked to US$2.9 billion in 2009). It is the third-largest investor ($1.8 billion) after Thailand and Singapore. But it is increasingly concerned over two developments, both of recent origin. Firstly, unrest in the Myanmar border areas dominated by ethnically Chinese Kokang minority group. Secondly, an increasing public perception in Myanmar, like in Balochistan and Northern Sri Lanka, that Beijing is a plunderer of their resources even as the Yangon regime banks on Beijing for help in matters of infrastructure and defence. In August 2009, the Myanmar army cracked the whip against the Kokang rebels. The result was some 37,000 refugees in Yunnan province. To prevent such slippages, as the situation remains volatile on the Myanmar side, China’s People’s Liberation Army has recently deployed 5000 troops along the border. Myanmar received Chinese arms worth $1.2 billion in the past decade, mostly by way barter deals, interest-free loans or discounted prices. While the army got among other weapons, Type 6911 medium battle tanks (100) and Type 63 light tanks (more than 100 but only sixty are said to be serviceable), Type 85 Armoured personnel carriers( 250), multiple-launch rocket systems, howitzers, anti-aircraft guns, HN-5 surface-to-air missiles, mortars, assault rifles, recoilless guns, rocket-propelled grenade launchers and heavy trucks, the air force received Chengdu F-7M Airguard jet fighters, FT-7 jet trainers, A-5M ground-attack aircraft and transport aircraft. The Navy’s acquisitions were Hainan-class patrol boats, Houxin-class guided-missile fast-attack craft, minesweepers and small gunboats. China is also building radar, refit and refuel facilities at bases in Sittwe, Coco, Hianggyi, Khaukphyu, Mergui and Zadetkyi Kyun. As much as 87 per cent of the total investment in Myanmar has come from China. It is focused mainly energy and minerals – 90 projects in all covering hydro-power, mining and oil and gas sectors to meet the demands of its landlocked southern Yunnan province. The Wen visit marked the formal launching of the work on 1100 km long Myanmar-China oil and natural gas pipeline project. Both pipelines will take off from the Kyaukpyu port (a venture of China National Petroleum Corporation) on Myanmar’s west coast and enter China at Ruili in the Yunnan Province. A Lex Rieffel study suggests that Myanmar’s earnings from the energy sector will double in the next five years. While the US imposed sanctions on the import of precious stones from Myanmar, China’s presence in that country’s gem mining and export industry soared. China’s string of pearls is not only on the coasts but also on the land. One such pearl is the Karakoram Highway. Nepal, the landlocked Himalayan state, is another. Karakoram Highway connects China’s Xinjiang region with Pakistan’s north. Dubbed as the 9th Wonder of the World because of its high altitude, the highway took 20-years for completion. When it was opened in 1986 the road fast tracked the China-Pakistan trade through the mountains, not far from the Line of Control in Kashmir. China is also building a road in Pakistan-occupied Kashmir since the early 1970s. The status of the road is not known. It is said to be still under construction. Nepal’s political turbulence is not coming in the way of China’s engagement with that country. China has allowed bilateral trade to quadruple since 2003. Recently, it increased its annual aid by 50% to about US $22 million. It also advanced $200 million as soft loan to take up a 61 MW hydro power project and some other infrastructure ventures. China’s interest in Nepal is primarily guided by its Tibet concerns. This is also clearly reflected by stepped up Beijing’s involvement with Nepal after the ethnic Tibetan uprising in March 2008. Nepal is home to some 20,000 Tibetans with around 2,500 trickling down in search of better life every year. Under Chinese pressure, Nepal has tightened border controls. And the number of new refugees has dropped to about 500. China has decided to restart the tourist bus service between Lhasa (Tibetan capital) and Kathmandu (Nepal’s capital), which was suspended in 2006. At Nepal’s request, it is planning extension of the Beijing-Lhasa railway line to Kathmandu. The 1956-km long Qinghai-Tibet railway breaks the high-altitude barrier to bring China’s Main land closer to the remote Tibetan region. Its strategic importance and the geo-political implications go without saying. 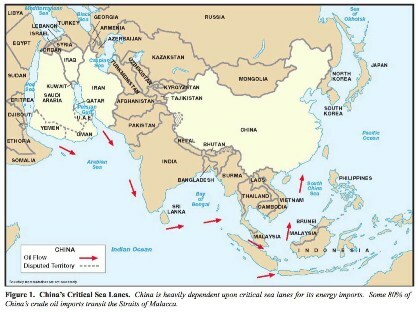 From the above narrative, it is clear that to date China’s investments extend from Hainan Island in the South China Sea, through the littorals of the Straits of Malacca, the Indian Ocean, and Arabian Sea to the Persian Gulf. It has interests in ports at Laem Chabang in Thailand, and Sihanoukville in Cambodia. These developments including the upgrading of airstrips, many supported with military facilities (like at the Woody Island, close to Vietnam) have strategic implications for countries in the region. Is China’s interest benign? 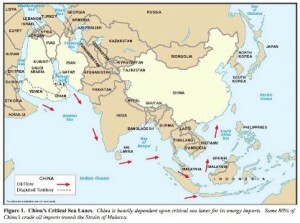 Is the “string of pearls” strategy the strongest pointer yet of China anchoring its energy supply lines with the Middle East and embarking on a level of Southeast Asian trade? Our assessment is there is little room for optimism as the balance of power in the Indian and Arabian Gulf is showing signs of shifting towards China. I don’t even understand how I stopped up here, however I assumed this post was once great. I do not recognise who you are however definitely you’re going to a famous blogger should you aren’t already 😉 Cheers! You have motivated me, I must write something about it. Hello! I found your website by accident this afternoon, but am really pleased that I did! Not only is it appealing, but also straightforward to use compared with lots that I’ve seen! I was trying to find out what theme you had applied, – anybody have any idea? I’ve applied a similar primary design myself, but can see that your web site loads far more swiftly, though you seem to have a lot additional material. The only problem I’ve had is with the header, which seems smaller that the actual page in Opera v8.0, though it seems OK in IE and in firefox… maybe it’s time to adjust! Good web site, incredibly tidy job, and a fantastic inspiration for my extremely humble attempt! I’ll be looking to improve my own web page and will certainly visit again soon! Can you make the text size larger? I am having a lot of trouble reading some of this without my glasses. I’ve been searching for a short time to get a great study with regards to this kind of topic . Searching in Aol I finally stumbled upon this website. Seeing this I am delighted to pronounce that I get a fine impression I discovered exactly what I was ready for. I’ll make certain to don’t forget this blog and look it over consistently. Say thank you for any incredibly apparent and practical posting. I am undeniably a violator of many of these guidelines. I usually unearth myself conflicted when producing a weblog article because I see by myself writing greater than men and women would like to examine, but I sense that I really need to do the subject matter proper rights by totally covering up it. I believe that by subsequent a number of these procedures I end up slicing out critical facets towards the dialogue. I guess you will have to locate a balance. Have you had difficulties with spammers? I also use Blog Engine and I have some great anti-spam practices; please Email me if you will be interested in an exchange of ideas. I like the style and design of the web site. I had a peek at your source code, I hope you don’t mind, to find what theme you are using. Is it it a free theme or do I have to purchase it? You undoubtedly saved me atleast 1 hour of time. I am making a project about this topic and your document has helped me through one of the topics of my project. I will browse to the other pages now. When I arrived to this post I can only see another 50 percent of it, is this my internet browser or the internet site? Should I restart? Many thanks for display extremely decent informations. Your word wide web is great.I am impressed by the material that you’ve on this blog. It exhibits how very well you understand this subject. Bookmarked this excellent web page, will come back for extra. You, my buddy, amazing! I discovered just the details I by now explored in all places and just couldn’t uncover. What a perfect web site. Such as this web-site your website is one of my new much-loved.I similar to this info proven and it has given me some kind of ideas to have good results for some cause, so keep up the beneficial operate! Hey really nice web log, I found your site as I was doing investigation on possibly how to develop my blog. I was just now which spam software you employ for comments as I get tons on my blogs. Your blog page is incredibly interesting,I want to connect with u,could i sent e-mail for you? Thanks for a great post and interesting comments. I found this post while surfing for some popular lyrics. Thanks for sharing this article.